When I was young my parents bought me a used electric guitar. I was thrilled. I envisioned myself becoming a rock star until reality set in and I learned that becoming a rock star requires musical talent and a whole lot of work. My rock star dreams lasted about a month, but my parent’s money was not wasted. My little brother, Mike, took my abandoned instrument and taught himself how to play it. Mike had a gift. He went on play the guitar every day for almost 35 years until the day that he went home to be with the Lord. Although Mike was one of the best guitar players that I have ever heard, he never played in public. Not even once. He never recorded any of his music either. You see Mike didn’t learn how to play the guitar to impress anyone – He just loved to play. 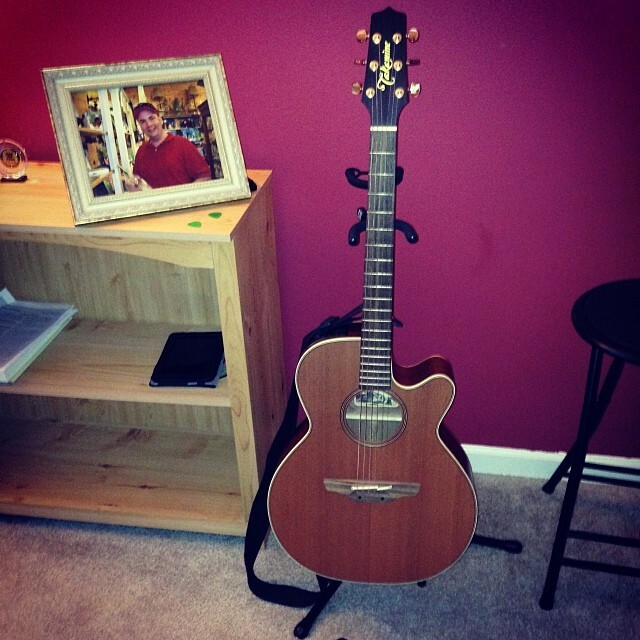 He found solace in the music that he played and his guitars became close and trusted friends. Music is a gateway to the soul and many have found comfort and freedom through its doors. When King Saul, the first king of Israel, was tormented by an evil spirit it was the stringed music from a young shepherd boy named David that brought comfort to his soul (1 Samuel 16:23). Now I have my brother’s abandoned guitar and it’s time for me to learn how to play – again. I want to learn how to play to keep my brother’s memory alive. My fingers are getting calloused but my heart feels alive and close to Mike when I play his guitar. I will never play like my little brother, but he taught me that if you play music for the right reason it doesn’t matter how good you are. I play for Mike now, and I play for Him. Update: my son, Andrew, has picked up Mike’s guitar and you can hear some amazing praise music that he is making for Him here. Such a touching read. Believe me, from one frustrated perfectionist to another, it isn’t what you do to the music (in my case, that can be torturous! ), but what the music does to you. In your case, it keeps Mike close, and enlivens a heart of praise in the midst of grief. That’s worth everything in a world of misplaced values. Lovely. Such feeling. It would be good if you would write a song, and set it to music if you like, or have your son do it.